Japanese Episode AG 069: "Touka Jimu no Kiki! Katei no Kiki!!" American Episode 341: "Love, Petalburg Style!" As Satoshi goes to the Pokemon Center to let his pokemon rest before his rematch against the Touka City Gym Leader, Haruka and her friends return to their house. Haruka and Masato are happy to see their mother, and soon Mitsuko treats her children and Takeshi to a meal. When Haruka and Masato ask where their father is, Kinji, one of the Gym Leader's students, tries his best to distract the young trainers. Meanwhile, Satoshi finds Senri, but the young boy is perplexed when he sees him being friendly with the city's Joi at the Pokemon Center. Back at Haruka's house, Kinji takes the gang to her father's house to tell him why he was acting so strangely. Apparently, Mitsuko suspects that Senri is cheating on her with Joi! Masato doesn't believe him, so the gang all heads toward the Pokemon Center to confront the normal-type trainer. Just as they meet up with Senri, however, Mitsuko shows up and announces that she's leaving her husband! However, the family is forced to put their crisis on hold to take care of the Rocket-Dan, who have broken into the greenhouse where Senri keeps his pokemon. After taking care of Rocket trio, Senri explains that Mitsuko misunderstood him, and that he had gone to Joi because she was an expert at fireworks. He had wanted to give her a fireworks show for their anniversary, and so Mitsuko decides to forgive him. As the fireworks commence, Senri agrees to battle Satoshi the next day, so the young trainer from Masara Town eagerly awaits his battle for his fifth Houen Gym Badge. I don't know if any of you guys read the episode synopses I post at the top of every Episode Comparison. I know that when I looked at websites like DBZ Uncensored or Sailor Moon Uncensored, I would often skim right past the synopsis to get right to the edits. The reason I include the synopses in my comparisons is 1) to fill up the page, and 2) to give my audience (and, at times, myself) a bit of a memory jogger as to what's going on, since I often do these episode comparisons out of order. Well, if you read the synopsis I posted for this episode, you'll notice that the plot is slightly different in the dub. While it's true that the overall plot is still there, it's watered down a whole lot for the dub. The Japanese version never really outright says that the two are having an affair (though the synopsis for the episode on TV-Tokyo's site does), but it's at least a whole lot less ambiguous than the dub is. It's mentioned that Senri and Joi are suspected of foul play several times in the Japanese script, "Norman" and "Joy" are hardly ever mentioned in the same sentence. I find the ban on talking about an alleged act of adultery to be a bit ridiculous considering that Flint was allowed to walk out and leave his ten children alone to fend for themselves without the censors raising a stink. Otherwise, there are a few other things going on with this episode. 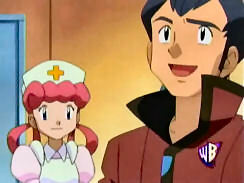 It seems like everyone but Ash and his friends and Team Rocket were recast, since Norman, Caroline, and Nurse Joy all had different voices. Well, actually, I think Norman's voice actor could be the same, but he's using his young Yugi voice instead of the voice he used in "There's no Place Like Hoenn." I had no problems with the voices for Slakoth, Vigoroth, or Slakking, so the next episode will be fun to watch. The first two seconds of the episode are cut, as usual. So it's already weird that everyone in Touka City seems to know who Takeshi is. He didn't join the group until after Satoshi went through Touka City and picked up Masato, so why does he seem to be so friendly with Kinji, Mitsuko, and Senri are? Nurse Joy: "Oh! Welcome back, Ash!" Originally, Joi just gives Satoshi the standard Irasshai (Welcome!). 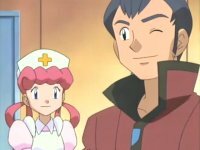 She doesn't give any indication that she remembered who Satoshi was, since he would be just one of probably hundreds of trainers who would have gone through the Pokemon Center. And that's only assuming that he visited the Center off-camera, since he sure wasn't there in "There's no Place Like Hoenn." Other than that, though, every other instance of two characters who have never met each other talking as if they've known each other for years is present in the Japanese version. You can't blame 4Kids for having, say, Brock know who Kenny is. When Satoshi asks Senri what the big secret is, he says that it's nothing. As he says this, he's blushing a little bit. The blush is painted away in the 4Kids dub. The edit was done to eliminate any double meaning viewers may have gotten behind Senri's line since, as we find out later, Norman and Nurse Joy aren't even allegedly doing anything that they're not supposed to be doing in the dub. Kenny: "You see, I think there's something weird going on with your mom and dad." May: "What!? What are you talking about?" Originally, Kinji said that he suspects that Senri and Joi are together. Haruka responds by saying "...with Joi?" I think the next bit is the same in both versions, or at least the gist of it is. The next dialogue, during which we see Mitsuko packing up her things, is more or less the same in both versions. The only difference is that in the Japanese version, Kinji says that he believes in Senri. Kenny: "I don't know, it doesn't make sense. And she won't talk about it, either." Originally, Kinji did say that it didn't make any sense, but he didn't seem to blame her for the problem the way the dub does. He just wonders what they should do. Meowth: "Now what is that ting?" James: "Let's see...a rocket launcher perhaps?" In the Japanese version, Kojirou guessed that it was a fireworks machine. He doesn't mistake it for a rocket launcher. But in any case, my question is this: What is Senri doing with a fireworks machine in a GREENHOUSE!? Unless there's some opening in the roof that we don't see, I don't see how Senri can have fireworks without setting the whole place on fire. Brock: "When you got married to Caroline, you promised to love her and protect her and spend time with her. Word is you're not fulfilling that promise [leaps in between Norman and Nurse Joy]. Tell her that you're sorry! Grovel if you have to!" While the first part of Takeshi's dialogue is the same in the Japanese dialogue, the part where he jumps in between Senri and Joi is different. He doesn't ask Senri to apologize to Mitsuko; he asks him to leave Joi instead. A lot of people will argue that Norman is still having an affair in the dub, but dialogue changes like this combined with the paint edit in this episode tell me otherwise. 4Kids obviously had a problem with the original plot, so they changed it so that Joy is just sort of there instead of being in the middle of the problem the way she is in the Japanese version. To me, it seems like 4Kids is trying to make it so that Caroline is mad at Norman for forgetting their anniversary, which, while better than banning the whole episode entirely, still seems pretty spineless on the censor's part if you ask me. Hey, did you guys hear Caroline say "Good Lord!" in the dub? Weird. Two seconds are cut from the shot of Senri right before Kids' WB! 's final commercial break. Another two seconds are cut from the pan shot right after Kids' WB! 's final commercial break.